Sometimes you have a perfect plan put together. The weather is right, the wind is perfect, the baitfish are schooling, and everything, on paper, falls into place. Then you hit the water and your plan comes to a speeding hault. The fish are shut down and spread out. The bites are few and far between and those that you actually get are small. The wind is gusting in twenty different directions. Now you have to just salvage your day. This was my past weekend of fishing. We were thrown a curveball - and I have always been more of a fastball hitter. But when things went sour, we adjusted, and found a way to turn our bottomed out plan into a successful trip. It started on day 1. Bill and I had about three and a half hours to fish and were hoping to get some footage of northern (Kentucky) spotted bass. Since we were down near the North Carolina-South Carolina border, I knew a spot on the Catawba River where I had caught a pile of spotted bass in the past. In fact, during almost every trip there previously, my target had been largemouth bass and all I could seem to catch were spots. Included in my previous catches at this location is my biggest spot ever - a 4.5 lb fish that was caught the day before a tournament (and it jinxed me bad the next day). So we hit the water in the mid-afternoon to find a stiff breeze pushing us up-river. We worked around some bridge pilings with nothing to show. Then we hit up a concrete structure - nothing. Next a large pipe with rocky drop-offs - again nothing. Then an outflow pipe - still nothing. Things were not looking good. Finally I tossed my plastic worm along a downed tree and set the hook on a nice fish. It rolled in the water and I could see it was a solid bass. After a spirited tug of war, I netted the 16" largemouth. It was an ice-breaker, but I was hoping for a spot. Then Bill and I split up to try some different areas. He had a couple follows on a jerkbait before having a nice fish (species unknown) break his line. I managed my first spot of the day - a 7"-8" fish that barely made it to my yak before flopping back to into the water. As I worked my way down the bank I noticed a flat with a deep drop on the near side. I threw my worm to the drop and it immediately got hit. The fish was going crazy. It ran under the boat, came completely out of the water three times and managed to pull me through some viney limbs. Finally, I was able to net the chunky bass - an 18" largemouth. Two casts later I again felt a bite, set the hook, and tangled with a solid fish. Again, it was a largemouth, this time measuring just short of 17". At this point, I had a sneaky suspicion the spots were deeper chasing baitfish. Since I had no depth finder, desire to troll nor longing to fish a jig/Carolina rig/shakey head super slow, I kept doing what I was doing. I hit another largemouth on a downed tree - a 16.5" fish. I then proceeded to lose what felt like a good fish in a set of limbs before landing another chunky bass. And again, it was a largemouth - measuring 15.5". I had managed to put together my best ever stringer of largemouth in this location - by far. But could I seriously go the whole afternoon without catching one decent sized spotted bass? It was time to turn and paddle back to the dock - roughly 2 miles straight into the wind. I met back up with Bill and we paddled along the bank, making casts from time to time. I picked up another half dozen largemouths before we left - all in the 12"-14" range. So our day of filming spot footage was a bust for me. I wasn't sure whether to be happy with the largemouth results or frustrated at the lack of spots. But sometimes you just have to take what the river gives you. Bill, however, was able to find a spot that wasn't camera shy. He threw his tube near a creek mouth and hooked into a fish that went nearly 13". We documented the catch for the BASS Slam and sent him on his way. What was crazy was that we kept him in the livewell for a few minutes while we prepped the cameras and found good lighting. While the fish was in the tank, his black spots totally vanished. But after we got him out and held him in the sun for a minute, they re-appeared right in front of our eyes. That was really cool to watch and shows just how effectively bass can camouflage themselves. So day 1 ended with only one decent sized spot and a bunch of largemouth footage. I guess I couldn't be too disappointed with the results, but it does mean I have to go fish for KY-Spots again in order to get more footage. That isn't exactly a dream trip during November in the Piedmont. Day 2 would take us into South Carolina to fish for smallmouth bass. We spent the night with good friend Eric Boyd who just launched Foothills Angler Guide Service. 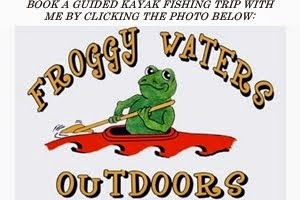 The next morning, we met up with a host of talented anglers - some of whom I knew and others I didn't. The motley looking bunch included Tim Perkins of Riversedge, Matt Frazier of Living Waters Outfitters, Caja Ormand, Eric, Bill and myself. The resume of this group is impressive to say the least. Our goal was to put a hurting on some river smallmouth bass. In particular, Bill and I were hoping to get some footage and pictures for the BASS Slam. We knew that the stretch also had good quantity and quality of largemouths, but that was not our priority on the float. I started off throwing a Megabass X-Dad crankbait. This little gem came in a large lot of crankbaits I bought off of eBay a month ago. I sold the rest and kept this one, knowing that it had smallmouth written all over it. Ufortunately, it didn't produce. I had one fish hit it, but not get hooked up...and that was it. However, I think crankbaits were thrown as much as any other bait over the course of the day and I believe only one smallie was caught on a crank the whole float. In fact, smallies were very, very hard to come by. Most of the ones caught were under 12" and there was no consistent pattern. Early in the day, it looked like the bite would be good. Eric landed a short, but fiesty smallie on a Mepps and Matt landed a couple solid largemouths on a crankbait. It took about an hour, but I finally landed a couple 8"-9" smallies on a finesse worm and drop shot rig. Bill also managed a few shorts and I know Caja landed a couple healthy smallies around 12". By the time we were mid-way through the trip, the bite was dead. None of us were catching fish and we were all a bit puzzled. We had thrown the tackle box at them and nothing was producing. Then Tim picked up his spinnerbait and the day changed. Tim had given me a spinnerbait from Premier League Lures when I was in Alabama in June. It was called the "River Special" and he had been helping PLL to design it. A mix of chartreuse, white and orange, it mimics almost any type of baitfish or bream and looks really good in slightly stained water. It is also equipped with a unique blade called the "fade blade" that changes from gold to nickel (silver) mid-way down the blade. I had caught a bunch of fish on it this summer and worn the paint almost entirely off the head. Tim was generous enough to give us each a couple of the baits before we launched, but I am not sure if any of us, including Tim, started the day with them tied on. Now back to Tim picking up the spinnerbait. Within a couple casts, he hooked into a solid largemouth. Shortly after, he hooked another. Then Eric landed a nice bass. The largemouth bite was turning on. It was everything I could do to not paddle to the banks and target largemouths, but I resisted. I was there to catch smallies, and had to remain focused. Bill and I were fishing hard....really hard. We tried every trick we knew with no luck. Finally, he got a bite on a jerkbait and landed a smallie that would beat the 12" qualifying mark for the BASS Slam. He measured right around 14" and was a chunky fish. I was feeling the pressure. Not long after Tim let out a yell. He had hooked a big fish. At the time, I had no idea what it was, but I had gone too long without a bite. I picked up my spinnerbait rod and threw the River Special toward a log near the bank. Bill took the moment to make fun of me, joking that I had finally decided to pick up the bait. A few cranks later my spinnerbait was crushed. The fish pulled some drag and double over my Carolina Custom Rod. He hit the net and measuring board - a very solid 20" largemouth. But it wasn't the smallie that would salvage my day. It turns out that Tim's fish was a smallmouth that hit near a boulder. It measured 21" and 4.5 lbs and was the highlight of the trip. 20" largemouth on my first cast....that's how I roll! Since the day was coming to an end, I again started targeting smallies exclusively. I was still trying everything and anything to get a bite. I was deflated and trying to not mentally give up. Finally, not 50 yards above the take out, I spotted a log that extended into the water. Where the log entered the water there were a couple of angled rocks. It looked like a smallie type of place. I picked up the spinnerbait again and threw it toward the log. As soon as it came over the first rock it got hit, but the fish missed. As it came over the second rock it got inhaled. I could see the bronze and knew it was a good fish. I had forgotten just how hard smallmouth pull. I grabbed the net, a new addition to my yak gear, and reached to scoop him. Strike #1. I was nervous I would lose him as he made a hard run. I stopped him and again pulled him toward the boat. This time, the net found its mark. I don't think I have ever been so relieved. 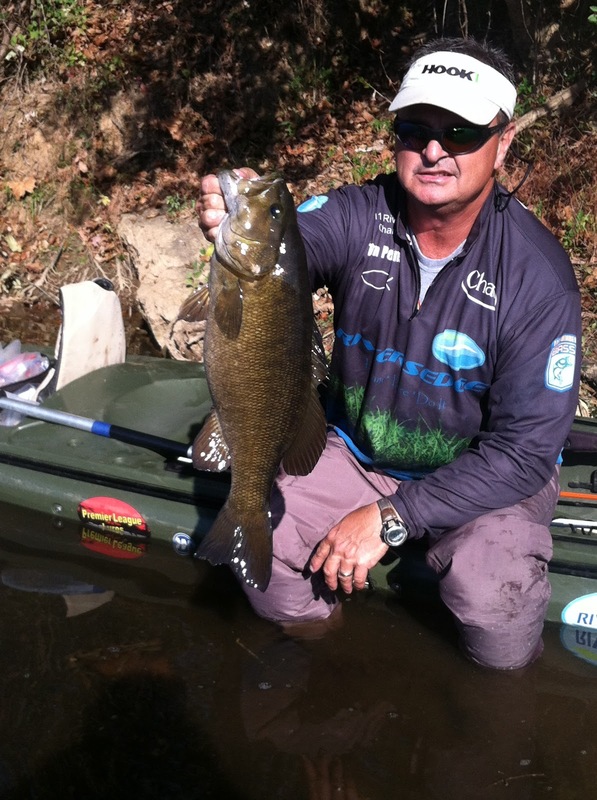 Although I caught a number of BASS Slam qualifying smallies on the New River in Virginia this year, it was my biggest of 2012. The fish measured 16" and hadn't been missing meals. Now, I could call it a day. Bill pulled up to help me take photos and said that Matt had just landed a solid 16" smallie as well. We got the photos we needed and let the fish go. We fished the remaining 50 yards fairly haphazardly before catching up with Eric and Caja at the take-out. It wasn't the day we had dreamed of - nailing smallie after smallie - but it was a good day on the water with a great bunch of anglers. We joked and reminisced as we packed up our gear. And after a group picture, we headed our separate ways. It is refreshing to be around such good people and just further shows that the kayak/canoe river fishing community is second to none. In fact, I wouldn't be suprised if a trip like this becomes an annual or biannual occurence for the group. Until next time, tight lines! Excellent write up Drew. One of the best I have seen yet. Congrats to you and the crew on a great trip and hats off to Tim for sharing those spinner baits and that big smallie he landed. Keep it up fellas. Thanks Jon. I'm glad you stopped by. I hope to see some giant shoalies on your blog next year my friend. Tight lines! Excellent post and keeping landing those largemouths--you remind me of myself back when I was younger--enjoyed the post!! Everything may not have gone according to plan but you certainly can't say the results were terrible. Every time I read of you bringing in another fish I pictured it being cooked in some way. I had to pause at one point to stop thinking about it. I had some delicious fish the other day, deep fried and dressed with onions marinated in vinegar and other spices. It was delicious but since then I've been longing for more. I can just picture your catch, or at least some of it, being roasted on an open fire with a bit of salt and pepper.